The Oiles LF Guides are guide units composed of Oiles Drymet LF and dust seals incorporated in aluminum housings. 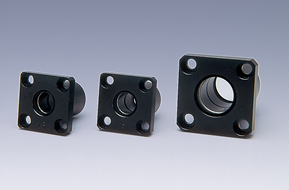 ■ Incorporates Oiles bearings for self-lubricating operations. ■ Features low coeffi cient of friction and superior wear resistance. ■ Easily mountable. Compatible with ball bearing types. ■ Low prices with simple structures.